In the time since we aired the last show, I have come across a couple of great articles from The Wall Street Journal. The first was a letter to the editor from Anthony R. Palmer, M.D. Dr. Palmer, clearly an intelligent man, wrote of his frustration regarding the current tax rates. To support his argument, he included some calculations that he made after the White House released the 2010 tax returns of the President and Vice President. Dr. Palmer calculated that the Obamas paid 26.6% of their income in taxes and that the Bidens paid 22.8% of their income in taxes. Considering that his income is substantially less than both the President’s and Vice President’s, he was irate to be paying a higher tax rate than they are, at 28%. What Dr. Palmer failed to realize, however, was that he was essentially comparing apples and oranges. The comparison of his marginal tax rate and their effective tax rates is simply not accurate or fair. I chose to pick on Dr. Palmer a little bit this week in order to illustrate that if an educated, intelligent doctor is able to make such a mistake, imagine how confused the average person is about the tax code. This supports the Money-Guy Tax Plan thought that we definitely need to simplify. The research shows that simply increasing taxes on the wealthy is not going to solve all of our problems, despite popular belief. In fact, if we were to take the top 1% of taxpayers (those earning over $380,000) and seize 100% of their taxable income, we would generate less than a quarter of our annual budget. Again, if we took all the income of the top 5% (those earning over $200,000), we would only generate enough to cover Medicare, Medicaid, and Social Security. In a nutshell, the rich alone aren’t nearly rich enough to cover our current budget. This is not an income issue; it appears to be more of a spending problem. We hear all the time, “the rich don’t pay taxes”. In an effort to put some hard number to back this up, I went to the IRS website and downloaded the data myself. In 2008, 90 million total tax returns were filed and generated a little over a trillion dollars of tax revenue. Of those 90 million returns, only 4 million reported earnings of over $200,000, but generated over $ 500 billion in taxes. That’s less than 5% of the returns generating over half of the taxes collected. To break it down, those making between $200,000 and $500,000 accounted for 3.4 million of the returns and generated $191 billion. 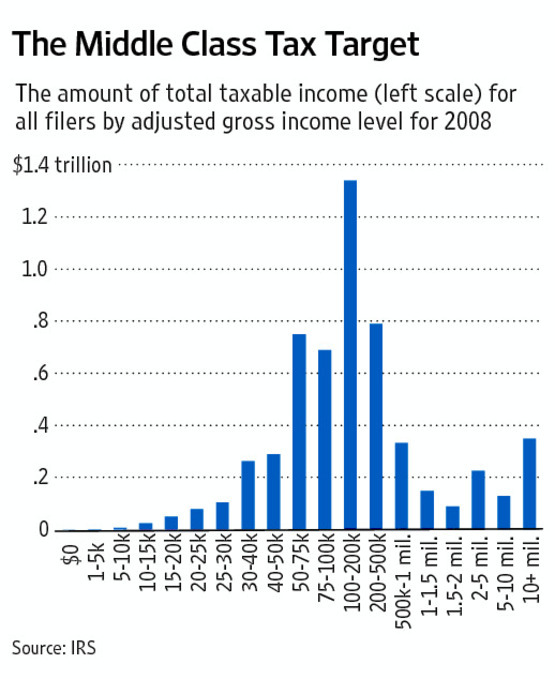 Those making between $500,000 and $1 million made up 837,203 of the returns and paid $321 billion in taxes. 291,058 returns reported earnings over $ 1 million and paid $230 billion in taxes. In that same year (2008), the total credits on returns added up to $49 billion. $48 billion of those credits were used by those making less than $200,000. Because we got so much great feedback from The Money-Guy Tax Plan, we close this week’s show by reading and responding to some of your comments and questions. We love hearing your thoughts, good or bad, and hope you continue to let us know what you think and how you feel. Our goal is simply to get the conversation started. On that note… remember to check us out on Facebook. Our hope is that this Facebook page will allow us to stay in touch more frequently than every two weeks. Thanks, again, for all of your wonderful feedback! First, thanks again for the podcast. It was cool to hear my name and blog post “on the air”, fun stuff. You changed my mind from my last comments, at least sort of. I thought you were dropping the tax rate on the upper brackets too much, but to see revenue drops only 7 billion (only… ha, ha), why that’s only 0.17% of expenditures, not a big deal. Yes I am a nerd, and was crunching numbers on my calculator while listening to your cast. I stand corrected – I was thinking your plan would not increase revenue, and you showed me it does, nice work. But wait, even though I was wrong, you proved me partially right. I hadn’t calculated any numbers, but instinctively I didn’t think your plan raised revenue enough to really make a difference, and now that you gave me the numbers, I still think it doesn’t. You mentioned a revenue increase of 113 billion, that’s only 2.8% of our 4 trillion budget (I think you said expenditures were 4 trillion, I don’t remember exactly, but that’s a nice round number). You presented some major changes to our tax system, changes that honestly would have no chance in our political environment, and it’s still chump change compared to our problem. For every dollar the government spends, we borrow about 30 cents of it. Sorry to say Brian, with your plan we still have 27 cents to go. And that’s just this year’s expenditures. Our debt is over 14 trillion. 100 billion dollars is an amount of money I can’t even understand, and it’s less than 1% of our national debt. 113 billion increase in revenue? Suddenly I’m not so impressed. The scope of the problem is scary. One thing that your calculations exclude is corporate taxes. Individual tax returns do not need to cover all the expenses, but part of it. Your premise that some combination of spending cuts and tax increases is need to fix the deficit is simply in error. I will prove it with real numbers. First, it’s not strictly-necessary. The Paul Ryan budget pays off the national debt while keeping tax revenue levels at this historical average (18-19 percent of GDP). Secondly, 100% of the deficit is caused by spending. Here’s why. As I say above, the historical (post-1960) average of federal tax revenues is a little over 18 percent of GDP. According to the Congressional Budget Office (February 2011 Economic and Budget Outlook), taxes will climb back to 18 percent of GDP in 2020, and higher from there. This is even if the Bush tax cuts are made permanent, the AMT is perpetually-patched, and the so-called “business extenders” are made permanent. So taxes are set to come in at their historical levels. What about spending? The historical level of spending has been 21 percent of GDP (creating an historical deficit of 3 percent of GDP, 21 minus 18). According to CBO, spending this decade will be 23-25 percent every year–way over the average–and will only climb from there as the Baby Boomers retire even more. So on the one side of the ledger–taxes–you have a reversion to the historical mean. Taxes are pulling their weight. On the other side of the ledger–spending–it’s totally out of control. 100 percent of the deficit problem in Washington is an over-spending problem. Great follow up. It helped a lot to hear some of the numbers you were talking about. A plan that does bring in more revenue is definitely needed. I like your idea of increasing the capital gains tax. In my comment on the first show, I mentioned that capital gains should be taxed at ordinary income rates. You said that was a bad idea because of the stimulative nature of capital gains. I don’t really understand that. Unless it is an IPO the company doesn’t really receive any benefit when you buy or sell their stocks or bonds, so I don’t see how market trading stimulates the economy. I would counter your claim that people always say “the rich don’t pay taxes.” I don’t think many people really think the rich literally don’t pay any taxes. When they say that I think they really mean “the rich don’t pay ENOUGH taxes.” I used to strongly believe we needed to really soak the rich, but as you say, it’s not a solution to our budget problems and the data do really show how unfair that could be. A return in the $1 million to $1.5 million range pays an average of about $303,000 in taxes. Doubling that to $600,000 does seem pretty unfair. I would certainly support a more progressive tax system than we have, and I do think that raising the average from, for example $303K to $325 wouldn’t be a big burden to the really wealthy. Although, as you point out, there aren’t enough people in that bracket to make a big difference. But at this point we can use whatever extra sources of income we can take. I would also point out that you say “…4 million reported earnings of over $200,000, but generated over $ 500 billion in taxes. That’s less than 5% of the returns generating over half of the taxes collected.” That is true, but I pulled the same IRS data and the point you don’t mention is that those same 5% of the returns represent a little more than 36% of the total income. It would be expected that the more you make in raw dollars, the more taxes you pay in raw dollars. The IRS data also shows that the idea that we need to keep taxes low on incomes over $200K specifically because they are the small business owners who run the economy is false. In 2008, there were about 3.4 million returns filed with income between $200K and $500K. Of those returns, only about 882,000 show business income or loss. That is about 0.25% of the returns for that bracket, and 0.006% of all returns. I find it hard to believe that tiny group of individuals is responsible for our country’s economic growth. The data also shows that the average net business income on those returns is about $87,000. That sounds more like a sole proprietorship to me than a small business that is employing a lot of people. Obviously the $87,000 can’t be their only source of income, otherwise they wouldn’t be in the $200K-500K group. If you look at partnership and S-corp income, there were about 888,000 returns with an average income of $113K, which could be coming from job creating small businesses, but again, that is about 0.25% of the returns in that bracket. So keeping taxes low on all 4.3 million returns over $200K in order to benefit the less than 1 million with business income, which may or may not be job creating small businesses, is like using a sledgehammer to pound a nail. If we really want to help small business owners who create jobs there are much more specific ways to do that. In fact, the average taxable income for the $200K to $500K group is about $285K, of which a full $215K, or 75% comes from salaries and wages. As I said previously, I know many couples who fall into that bracket and none of them are small business owners or responsible for hiring new employees. They are simply working stiffs like you and me, who happen to get paid very well for what they do. A couple each making $125K with some investments can easily fall into that bracket. Keeping taxes low on this group would simply allow them to put the money in their pocket, or send the kids to a nicer camp. It would not result in new jobs or boosting the economy. Obviously the other side of all this is spending cuts. We can bicker over farm subsidies and pork projects all we want, but until we start seriously dealing with the huge growth in Social Security, Medicare, Medicaid and defense spending, we aren’t going to be able to deal with the deficit in any practical way. Discretionary spending, representing all the “fluff” and waste people like to complain about, represented only 19% of the budget last year (about $656 billion). We could cut that number to zero, cut education, cut science research, cut farm programs, cut transportation, cut environmental protection, cut all non-defense discretionary spending to zero and we still wouldn’t have enough income to pay for the remaining entitlements, interest and other required spending. We would still be $637 billion short, that’s an 18% gap, even if we cut ALL discretionary spending to zero. We’re currently spending almost 60% more than we are taking in. As the economic crash of 2008 should have shown everyone, you can’t continue to spend that much more than you take in for very long without serious consequences. This level of overspending is completely unsustainable. The growth in entitlement spending is only going to make the situation worse. In the same way you say we can’t get all of our income from taxing a small group of rich people, we can’t get all our spending cuts from the small section that is discretionary spending. There are going to need to be significant cuts and/or benefit reductions in Social Security, Medicare and Medicaid as well as significant cuts in defense spending if we want to have any chance of getting the deficit under control. However, entitlement cuts are as politically unpopular as tax increases, so I’m not holding out much hope for either one. This formula should keep spending in check as it would require taxes. For example, spend less and taxes go down, spend more and taxes go up. Taxes should be shared by ALL Americans at an equal percentage of income.